will this work with the pico for cranking tests ,starter ,compression test, ect. 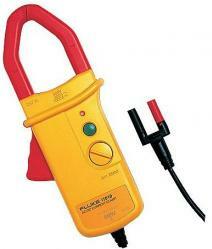 Yes you can use the Fluke i1010 with the Pico for cranking tests, starter, relative compression test, etc. However, the Fluke i1010 terminates to bananas, to connect it to the Pico you will need to use an adapter such the AES Flexible Adapter -- Male BNC to Banana Sockets (AES# 08-88-M). If you do not want to add another 'link' between your scope and the test point, we recommend the Pico 2000A/200A current clamp BNC (AES# pt-TA167). This probe terminates to BNC for a direct connection to the Pico and uses their built-in probe setup. The Pico will let you create and save a custom probe setups for the Fluke probe, and many others. If 2000A is too high, please check out the 600A DC current clamp with BNC connector (pp266) (AES# pt-TA019). This probe terminates to BNC for a direct connection to the Pico and uses a built-in probe setup.